Even the government – despite its sometimes contradictory policies on renewable energy – has made this idea a centrepiece of its solar strategy. The school also receives money for any electricity that is NOT used, which is sent to the grid for others to use – during weekends and school holidays for example. This is the Export Tariff. Setting up a project to install panels can be used as an excellent educational opportunity for the kids. While of course helping to reduce greenhouse gas emissions in the process. Some UK schools have already done amazing things. Saltaire Primary School recently installed a 23.76 kWp solar system on its roof, paid for with a 0% loan from the local educational authority. This is now earning the school around £3835 per year. 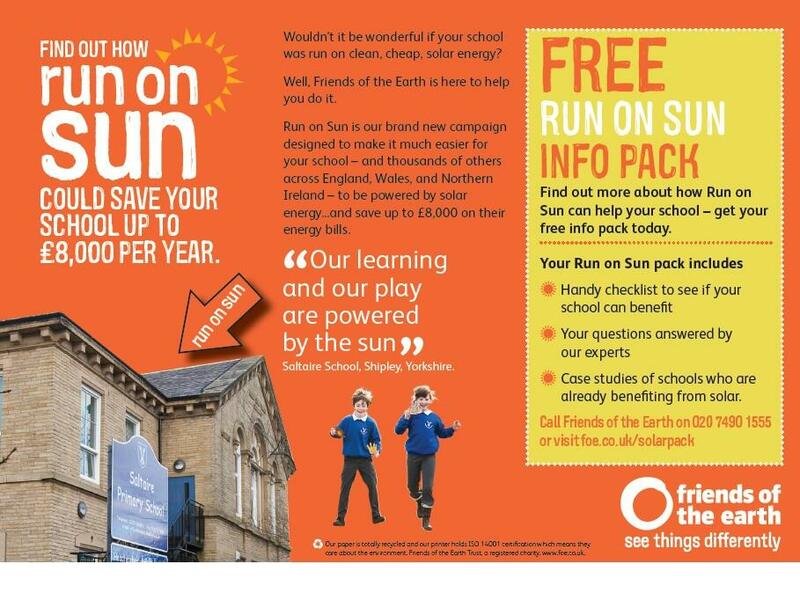 Over the next 25 years Saltaire Primary expects their panels to generate a revenue of £80,000, or nearly three times the cost of the panels. But how to make this happen on my school? I am currently leading a project to try to install solar PV on my son’s primary school in North London. We are still in relatively early stages, but I am confident we will get there, and I hope sharing my experience may help other parents or teachers who are considering this. Of course, I work in the renewable energy field so I am not going to pretend I am an “average” parent (whatever that means!). Yet, a lot of the work I’ve done so far has involved talking to politicians (convincing them of the benefits of setting up FITs, for example! ), writing about renewable energy, promoting its development in far away countries….but not much in the way of hands-on projects. So in this sense I am not too different from any other person trying to kick start a project for their local school. In fact, I grew up in a different country, so I find it quite hard to navigate the school system here as well as planning and local authority issues. So how did I get this project started? I had been hearing about solar school projects some time, and I was looking for ways to contribute some volunteer time to my local school. So I had been pondering how to start talking about it, and to whom, and when. One day in early March this year, I heard that our Parent School Association (PSA) had been successful with recent fundraising efforts, and was looking for ideas on how to spend the money as well as a focus for future fundraising. So, when the Annual General Meeting of the PSA came up, I thought this was the right time to bring up the topic. At the meeting, everybody reacted with incredible enthusiasm. The idea was approved unanimously with hardly any discussion! A lot of people came up to me enthusiastically afterwards, and wanted to hear more. Of course this does not mean there are no issues to be solved. The head teacher explained that a few years ago governors had looked into this idea but got discouraged by some complexities, particularly regarding the cost of a structural survey. In the next few days, I spent my time dealing with these and other issues, and coordinating with the head teacher and site manager to get some quotes. We are now quite close to choosing a company and we are waiting for final quotes. In the meantime, we are of course discussing how to finance this project. The PSA has committed some funds, and the headteacher is able to allocate some money from the school budget. This will cover about half so in the next few months we’ll have to focus on fundraising. – it may help to team up with other local schools or nurseries, if possible, to exchange information as you go. We are doing this with our local nursery, where one parents has taken the lead on installing solar panels there, following discussions at the school (she has kids in both). Of course, there is still a possibility that installing solar PV may turn out to be unfeasible at our school. In this case, the agreement is that we will look into other options to reduce the energy used by the building and/or to generate clean energy on site.